Luckily the conditions were better this year. About 12 knots of wind and quite sunny. There were 3 races scheduled and 18 cats on the starting line (with 2 F16!). In the first race we took a flying start and had clean air all the way up to the upwind mark. The rest of the race was close sailing with 2 F18 and after a second downwind run (with Kathleen trapping out) we finished half a boat length after a Nacra Infusion. The second and third run the wind kept increasing (up to about 15+ knots) and so did the waves. We had a flying start every time and got to the upwind mark in first position too. But on the downwind run the 2 F18 catched up every time and by the time we finished after the second run they were in front of us. We sure have to learn to sail windy and wavy (1m waves!) conditions with the spin a bit more, but finishing second overall makes us very happy! No pictures of us, but some images of the other sailors. 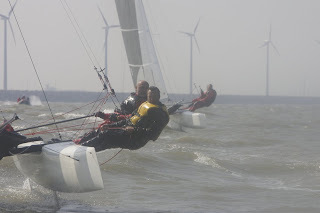 -> on the edge upwind! This weekend we'll pack the boat for 3 days of racing in Carnac, France! 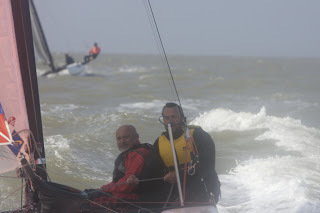 We're back from our first sail and regatta this year and here's the report. Friday afternoon we headed to Lac l'Eau d'Heure, the lake where the SNEH sailing club is located. After a two-and-a-half-hour drive we unloaded the boat and set it up. By the time the Blade was setup it was getting late in the afternoon and chilly so we decided to wait until the next day. 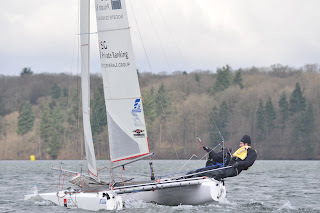 So our first sail would immediately also be our first race of the season! Saturday morning we met the other sailors and counted 5 boats. 4 single handlers and ourselves, there was an A-cat, two Shadows and a Bim X-16. Luckily Sunday started of better. There was sun, but temperatures were lower (not above 4°C!). Anyway, everyone was thrilled to go out sailing so we headed off. The first and second race we tactically sailed a good course, taking the shifts and finished first over the line, just in front of the A-cat. It was good sailing, double trap upwind and trapping with the spin downwind, where we did 14/15 knots. The 3rd and 4th race the Bim was really in action and finished ahead of us. Overall we were scored 2,1,2,3 and shared the first place with the Bim. He finished 2 times 1st (in the last races) and won the event. Anyway a fun event to do and a good "warm up" before heading to the North Sea again. Thanks to all the people who welcomed us at the SNEH.